It doesn’t take more than a cursory glance at the IPA section of your local grocery store to know that ratcheting up hop levels has helped fuel America’s craft beer movement. But could the flavorful flowers also be the next big thing in coffee? Quite possibly, and a Colorado roaster is leading the charge. For many, coffee and beer comprise the yin and yang of an average day. Coffee for the morning pick-me-up; beer for the evening come down. Even if they bookend your day, they do have a lot of similarities. Both are brewed, both tend to emphasize bitter flavors and both command their own houses (coffee- or brew-). So the marriage makes some sense. That’s why we’ve seen coffee-infused stouts in America’s craft beer lineup for years. But hops in coffee are a newer phenomenon. At the front of this trend is Denver’s Corvus Coffee Roasters. 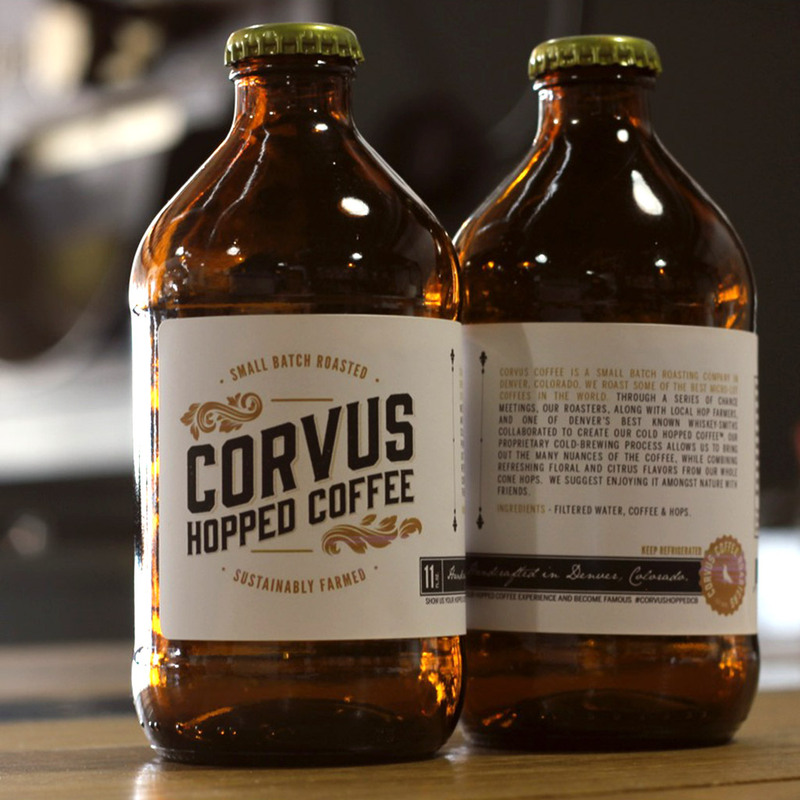 Their Corvus Hopped Coffee, a cold-brewed coffee made with whole cone Citra hops, has garnered plenty of headlines over the past year. We spoke with roastmaster Philip Goodlaxson about his product, his revelations when it comes to mixing hops with coffee, and the relationship between the coffee and beer worlds in general. 1. What are the origins of Corvus Hopped Coffee? Our involvement in the Denver beer scene led to hopped coffee. It’s hard to not be inundated with brewery culture out here, and we found that doing a lot of beer events in the summer not only led to a lot of great relationships and collaborations, but provided an avenue to reach out to the craft beer consumer. Doing a lot of beer events a couple summers ago made us want to find something that would be unique and tie into both beer and coffee. We started dry hopping the cold brew we were taking to the events, without a lot of expectations around how it would be received. The feedback we received was amazingly positive. We had people coming back two or three times to try the coffee or to get a jolt between all the beer samples. What really made an impression was how many people were posting pictures of our booth afterward. They were at a beer event, excited about coffee! 2. What makes Hopped Coffee unique, taste-wise? We experimented with a lot of different ways to brew this product, and scaling it also presented unique challenges. Going from a five-gallon system to a 120-gallon system wasn’t as seamless as we thought. We also experimented with different combinations of hops and coffees throughout the past couple of years, as well as looking into different methods for filtering the product. In short, we aren’t the type to just rest on a catchy product…we wanted to make something excellent. People were excited about the original batches, but they were just intended to be fun projects. When we saw the response, we knew we had to really dive in and focus on making a craft product, if this was going to go big. We experimented with probably 15 different hop varietals and tried a lot of different coffee origins to see what the best flavor combination was. We also did experiment briefly with hop pellets, but settled on whole cone hops. (I don’t want to raise the whole debate on cone versus pellet here. I’ll just say that for us, the pellets prevented the coffee from extracting properly.) The combination that worked the best was a fruit-forward, full-bodied coffee with a hop varietal that has a lot of citrus and floral notes and is limited on savory characteristics. This combines really well to make a very rich coffee, with lots of sweetness and some floral aroma and aftertaste. 3. Why do hops and coffee work together? In the beverage, the coffee and hops complement each other because they are each very powerful ingredients. There has never been anything in my experience that coffee doesn’t overpower, flavor- and aroma-wise. Hops are a big exception. Cold brewing coffee is great because it leads to a full and very rich beverage. However, because there is never any heat applied, the coffee is missing some of the brighter aromas and tastes. Hops can be cold brewed and their oils will still have a very strong brightness and floral quality in the end beverage. This serves to brighten and complement the coffee by bolstering the cup where it needs it. 4. How popular is Corvus Hopped Coffee? We just signed a deal to get going with a distributor throughout the region, and then we are expanding more nationwide. We’re already in Whole Foods throughout the Rocky Mountain region and at quite a few bars, offices and restaurants. We have a program that allows for wholesale customers to get a free kegerator with their initial order of kegs, or a cooler with an initial stock of bottles, and this has been really popular in offices in particular. We get a lot of emails and phone calls about it, and the main problem at Whole Foods is keeping up with demand, so it’s pretty popular. 5. What are customer reactions? Is coffee with hops a thing people try once, or are there fans who go back to it regularly? A lot of people are really into it, come back every week and pick up a couple of four-packs, or come in every day and get the hopped. Some people get a drink every now and again, and some people may try it once or twice and it’s not their thing. But I think this is a normal spectrum for every new beverage. I don’t think there’s any abnormality in how many people love it versus don’t, in comparison to a single beer in a 30-tap lineup. 6. Similarly, is this here to stay or just a crazy experiment? Do you think others will pick up on this trend? For us, this is here to stay as a product, and we are building more cold-brew options to complement the Hopped Coffee on the shelf. We’ll have some single-origin cold brews, and a cascara tea, which is brewed from the dried coffee cherry. We are already getting calls from people wanting to bring this on, or brew it in other areas, and I think it will be a trend that will always have a loyal market. Hop heads will always be hop heads, and lots of them are coffee people. 7. What’s the relationship like between coffee brewers and beer brewers? It’s quite cordial. I’ve met only a handful of brewers who don’t need coffee for the long nights spent beside the brewing tanks watching their batches. Coffee roasters tend to roast on similarly long shifts, but we have all the caffeine we need and generally want to throw back a couple of beers. We have trades with several breweries in town, and exchange coffee, beer and ideas on everything from roasting beans and malts to hops to brewing to general packaging and distribution. I think it’s very important to get outside your industry and exchange ideas with kindred souls. I always gain something from talking with these guys, and hope it’s the same on their end. Is Beer the New Gatorade?